An LCD display and digital controls give you plenty of programming options with this DeLonghi super automatic coffee machine, which costs $1,249.99. The array of special features makes up for the high cost. One that we especially liked was the 25-ounce milk container that steams or froths milk for lattes and cappuccinos. 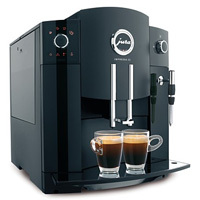 You can adjust the temperature and strength of the coffee and choose between three cup sizes. Cleaning the machine is easy, too, with all dishwasher-safe parts and a handy decalcification indicator light.